It's back... with a vegeance! All right, folks, these people are NOT messing around. With Snowmageddon II: With a Vegeance bearing down on us, the Good People behind the Dupont snowball fight held a rematch at 2 p.m. Wednesday. Washingtonians -- you've seen the victory claims, heard the battle cries and watched the combatants charge toward the fountain.... If you missed out on Saturday, but can make it on Wednesday, we want to see you there! 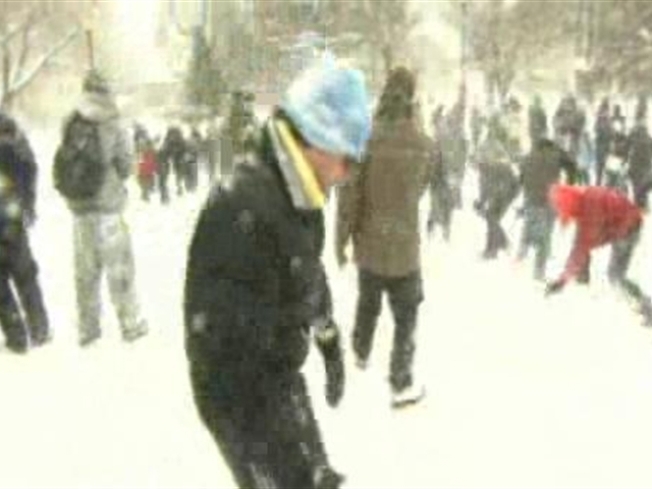 And for everyone who survived Saturday and still has a hunger for a good snowball fight –- let it rip! Feel free to bring your flags, banners, shields, ammo trays, drums, furry costumes -- and whatever else tickles your imagination! Well, gee, when they put it that way, we almost considered taping those plastic bags to our feet again. As of early Wednesday afternoon, there were 642 confirmed guests on the Facebook page. Of course, RSVPing "yes" to a Facebook invite is still akin to replying "maybe" in person, but some brave souls made it out. Hone your battle cries, and remember the Maine! Meanwhile, if you're looking to warm up afterward... er, or stay kinda cold, head to Bar Dupont (1500 New Hampshire Ave. N.W.) for their full-service, outdoor ice bar. It'll be open on their outdoor terrace through sunset, and they'll be grilling bratwurst and cervelat Sausage, and serving mulled wine and a full bar.